While the teaser trailer for Man of Steel debuted just a little while ago, those looking to go see The Hobbit in IMAX next week are going to be in for a real treat. While specifics haven't been mentioned yet, Warner Bros. is promoting the new Superman film similarly to the way they handled both The Dark Knight and The Dark Knight Rises in previous years, by showing an extended bit of footage during the holiday season. But even if you can't go to one of those screenings, a brand new trailer is also set to arrive very soon. But first for you we have a brand new poster. Batman and Superman fans have united on the Dark Knight Rises official Facebook page to unlock a brand new one-sheet for Man of Steel. Check it out below and click it to see it high-res. During the movie's Comic Con footage they showed a quick glimpse of Superman getting arrested, so this is a scene straight out of the films. 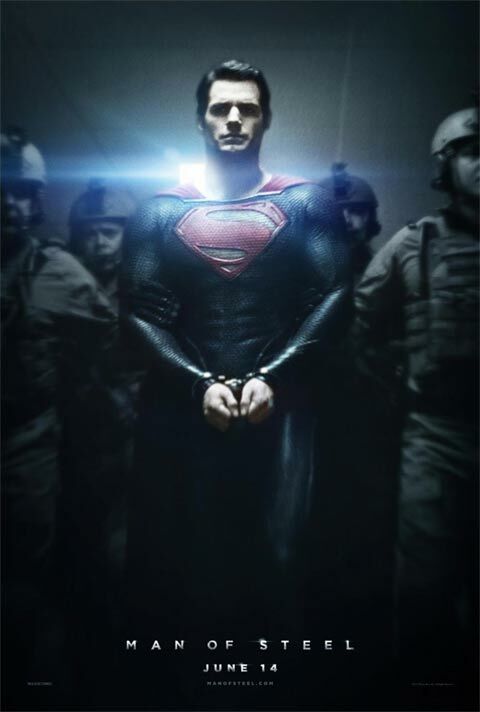 What's interesting is that handcuffs don't really do a good job of holding Superman down, so he must just be going peacefully. Directed by Zack Snyder, Man of Steel takes us back to the origin of Clark Kent on Earth and how he learned who he really was, while also defending the planet against the evil General Zod. The outstanding cast includes Henry Cavill, Michael Shannon, Amy Adams, Russell Crowe, Kevin Costner, Diane Lane, Antje Traue, Ayelet Zurer, Laurence Fishburne, Harry Lennix and Christopher Meloni. For more about the movie, head over to our Blend Film Database.